Before flying to Malta, it is important to think about the type of transports you are going to use. There is no subway or tramway service in the archipelago. However, the two major islands are well served by public buses, taxis and private shuttles. In this post, I am going to talk about all the possible options that you can use to travel on the islands of Malta and Gozo. Malta is the smallest country of the European Union. The archipelago is made of 8 islands, and 3 of them are inhabited : Malta, with about 400 000 inhabitants, Gozo (where I live), with about 40 000 inhabitants. The last one of these 3 islands is Comino, with… 4 inhabitants ! 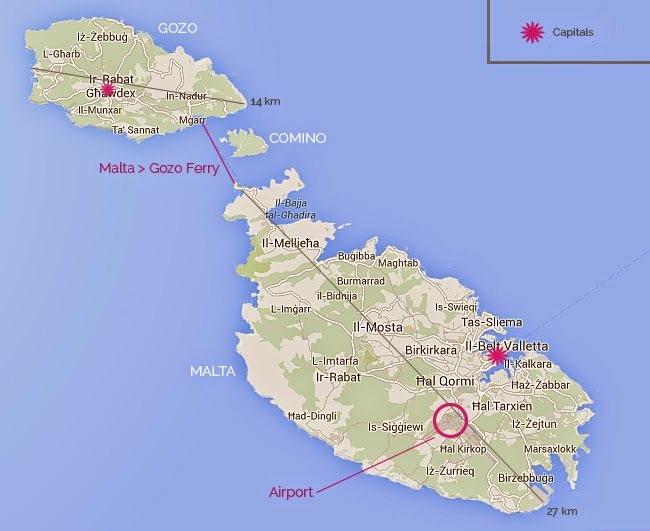 The main island is about 27 km long and 15 km wide, whereas Gozo is 14 km long and 7 km wide. However, these distances are misleading : despite their small surface area, traveling in these islands is not especially fast. The roads are sinuous, in poor condition, and the traffic on the main island is often slow due to roadworks or traffic jams. In Gozo, the roads are bad and the streets are (really) narrow : you need to be careful. One last thing to remember : in Malta, we drive on the left of the road, like in England. If you have more questions, my F.A.Q. post about Malta and Gozo may be helpful ! When you will arrive at the airport, you won’t have any trouble finding a taxi ready to take you to your destination. Prices are usually regulated : remember to take a look at the indicative prices displayed at the airport or near the taxis stations. Some don’t hesitate to scam tourists with bigger prices. I warn you : taxis’ drivers tend to drive fast and abruptly. If this bothers you, don’t hesitate to politely ask your driver to slow down a bit. The main maltese company is White Taxi Service. As the name suggests, these taxis are recognizable to their white colour. You will find stations in various places, including the airport, Valletta, Sliema or St Julian’s. You can also use eCABS, the maltese equivalent of Uber. Their prices are affordable and their service is great. I also call them when I need to go sowhere in Malta. If you are staying at the hotel, the shuttle company Malta Transfer will drive you there : competitive prices and plenty of room for your luggage. To explore Valletta, the maltese capital, you can use the Valletta Smart Cabs : small electrical cabs that will drive you in the city. Contact them at the +356 77 414 177. The main island is really well served by many bus lines. The price for a 2-hour ticket is 2€ since July 2015. However, you can buy a “7 day explore travel card” which will give you unlimited bus trips during 7 days, for 21€ (15€ for a child). A “12 journey explore card” also exists, which means you can have twelve 2-hour trips for 15€. You can buy these cards at the tickets offices in the airport, or at the bus terminal of Valleta, Bugibba and Victoria (Gozo). The simple 2-hour tickets can be bought directly in the bus, but be sure to have some change with you. Buses operate between 5:30 am and 11 pm. Night buses are available from Saint Julian’s (a great city to go out and party) and operate from 11 pm to 5 am. They serve most of the destinations. You can find all the schedules and information you need on Malta Public Transport. You can also contact them at the +356 21 222 000. If you don’t mind driving on the left of the road, you can rent a car to travel through the island. Be really careful on the road, maltese people are not known for their driving skills. For the record, a maltese man recently tried to get his driving licence and perfectly respected the rules of the road during the exam… which caused no fewer than four accidents ! You can use Mayjo Car Rentals which is the best service to rent a car in Malta. To go to the ferry station situated in Cirkewwa, you can use the taxis services I previously mentioned. However, I advise you to use Malta Transfer : you can get a small shuttle for a very attractive price, with all the room you need for your luggage. That’s what Gleb and I chose when we first arrived in Malta : 5 big suitcases, several travel bags and two cats in their boxes for a total amount of 30€. You can also take the public buses : the X1 bus will take you right in front of the airport and will drive you directly to Cirkewwa. The trip lasts more or less 1h30 and costs 2€ per person. The ferry trip lasts about 30 minutes and will take you from Cirkewwa (Malta) to Mgarr (Gozo). You can take the ferry with a car. You will only have to pay the return trip (from Gozo to Malta). Therefore, you have nothing to pay and no tickets to take when you leave Malta to go to Gozo. The return trip will cost you about 4,65€ per “pedestrian” (1,15€ for a child). If you have a car, this will be 15,70€ for the vehicle and its driver included. A ferry leaves every 45 minutes, you will find the schedules on Gozo Channel. Gozo is also served by buses, but they are less frequent : be really sure of your schedule unless you want to wait during one hour at the bus stop ! You will find every information needed on Malta Public Transport. 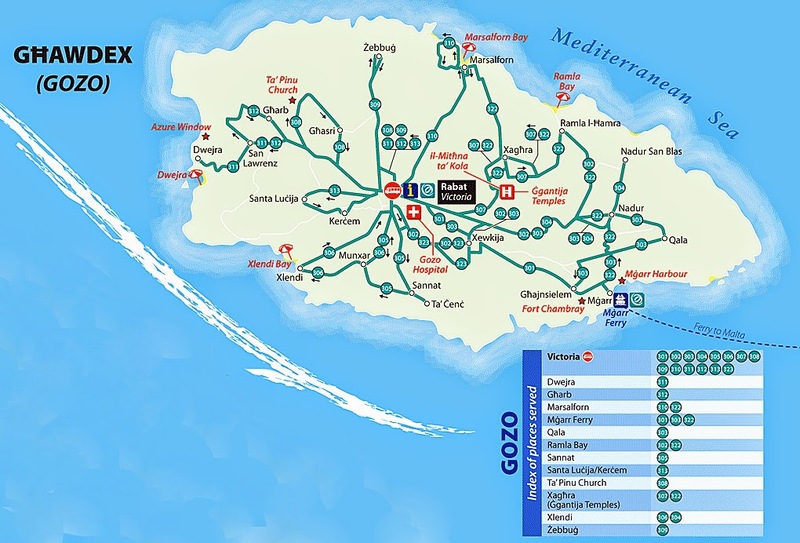 If you are going to Gozo for 24 hours or for a weekend, you might be interested in my complete program of places to visit in Gozo and the buses you have to take to get there. To rent a car in Gozo, you can use Gozo Garage, Mario’s Car Rental or Mayjo Car Hire. Discovering Gozo by bike, scooter or segway can also be a really pleasant experience. To rent a bike or a two-wheel vehicle, try On Two Wheels. To rent a segway, Gozo Segway is the best. Go to the the ferry station in Cirkewwa. You will find outside several companies ready to take you to Comino on a small boat. The trip will last less than 10 minutes and will cost you a total of about 5€ per person. If you are in Malta out of season, ask for information at the Tourist Office first : some boat companies only work during summer. Go to the ferry station in Mgarr. On the port, you should easily find several companies willing to take you to Comino. Like I previously mentioned, this will cost you a total of about 5€ per person. You can also go to the small harbour of Hondoq Bay, situated near the village of Qala. You will find the compagny JoyRide Watersports that provides a shuttle between Gozo and Comino (8€ per person) , but also boat rental, canoes, kayaks and other fun nautical activities. It is also possible to leave from other localities in Gozo, but since I live near Hondoq, I don’t need to go elsewhere if I need to go to Comino. However, I know that it is possible to leave from the Marsalforn harbour (situated at the north of Gozo). If you are staying in this area, this will probably be more practical for you. Planning a trip to Malta ? Don’t leave just yet ! → Discover my practical tips in Malta, especially all the information about flat or villa rentals or 20 things to know before traveling to Malta. → Find about my maltese recommendations, in particular where to go out in Saint Julian’s. → The places to see and to visit in Malta, especially Mdina, the beautiful silent city. → Finally, if you’re more attracted to Gozo, discover my guide of things to do in Gozo, the best gozitan restaurants, or even the most beautiful beaches of the island. this post was soooooo helpful, thank you!